In post-independence India, Bombay became Mumbai, Madras became Chennai, Calcutta became Kolkata, Mysore became Mysuru, Bangalore became Bengaluru, and now Allahabad has become Prayagraj. Then, before the row over Allahabad showed any signs of settling down, there emerged demands to rename Muzaffarnagar to Laxminagar. The love to change names from the past continues after more than 70 long years of India’s independence, and it will most likely continue on in the future as well. Although we talk of India as an emergent world power, it seems that the hangover of history is not yet over; it still lays buried deep inside the subconscious of the Indian subcontinent. Moreover, it beautifully explains the dichotomy of India, which on the one hand is nurturing an ambitious space program, while also periodically making attempts to reclaim its history on the other. Indeed, India is not just a country of diverse people and faiths, but also of diverse psychological states existing together – but not without friction. If he had lived in the age of democracy, perhaps he would not have said so, for in the name lies the identity that forms the core of politics in a democratic nation. Further, if the state happens to be like India, Pakistan, Bangladesh or Sri Lanka – a developing country with a long colonial past, dysfunctional government structures, poor administration and corruption rampant in the system – then politics and ultimately the democracy itself finds a safe shelter in fictitious issues of identity. This is so because real issues such as infrastructure development, economic growth, human resource development, and socio-political reforms are not so exciting for the people who remain hopeless and chafe under the burden of dysfunctional governance. Coming back to the main theme of this blog – the renaming of Allahabad as Prayagraj – the issue needs a little more factual elaboration. Firstly, Akbar did not name the city “Allahabad”; he named it Ilahbas, with “Ilahi” being a generic word for God. It was the British who later changed it to Allahabad, another demonstration of their policy to divide and rule. It would thus appear that although unwillingly and unknowingly, the Hindu nationalists have actually paid tribute to the secular soul of the Mughal Emperor Akbar. Secondly, no matter what you call it, the city is of immense historical and spiritual importance in India. It is the site of the confluence of Ganga, Yamuna and Saraswati, the three holy rivers of Hindu mythology and philosophy. These rivers have deep religious significance for Hindus, as bathing in them gives a Hindu divine merit. Hence, the city constitutes the very essence of Hindu identity. In other words, a Hindu has a same reverence for Prayag that a Muslim has for Makkah and Madinah. Further, Prayag was the capital of the mighty Gupta Empire, which is a symbol of the ancient glory of Hindus. Hence, any analysis of such incidents, such as the renaming of a city, has to be seen with its historical context. One-sided criticism of such initiatives as mere instances of Hindu extremism or populism disregards history and is unapologetic about the wrongs faced by Hindus in the past. It is interesting to note that even after 71 years, such symbolic initiatives are powerful enough to influence popular perceptions. This is mainly because despite independence, the Indian National Congress never addressed the sentiments of Hindus in India in an adequate and respectful manner. When prominent Gujarat leader KM Munshi demanded the government to organise the construction of the Somnath temple – destroyed by Sultan Mahmud of Ghazni in 1025 – former Prime Minister Jawaharlal Nehru objected to it, citing that in a secular country, the government has nothing to do with religious matters; an argument President Rajendra Prasad disagreed with. Similarly, Hindu temples were brought under state control, whereas minorities were given sufficient control over their religious grounds. The Hindu code bills regulated Hindu customs and marriages, whereas minorities received constitutional protection. Even in the writing of history, academics allegedly promoted by the Congress glossed over the excesses against the Hindus and glorified brutal rulers like Aurangzeb, Tipu Sultan and Alauddin Khilji. Thus, to this day, the Hindu mind feels the need to reclaim its history. Had the Congress addressed Hindu concerns in a respectful manner and made its secularism a genuine principle of governance rather than a devious political tool to garner minority votes, the questions and concerns over Hindu identity would have lost their relevance by now. Further, it must be noted that it’s not only Hindu nationalist parties or elements that are favouring such moves. Neither is it only against the medieval rulers. As noted above, the nationalist fervour has also led to the renaming of cities like Madras and Bombay, which were developed by the British. Even the regional parties who profess great loyalties to secularism have also supported renaming of cities in the past. For example, Mamta Bannerjee, who has taken on the flag of secularism after the political demise of Congress, enthusiastically supported the change from Calcutta to Kolkata. The trend of revisiting history by Hindu nationalist organisations in the form of populist demands like renaming towns is not something encouraging. In recent years, it has become identified alongside rising Hindu nationalism, especially after 2014. Moreover, this is noticeable in the case of Muzaffarnagar, which was the victim of the worst form of communal violence in 2013. After that, the city has witnessed a spike in communal passions and radicalisation in both religious communities. In light of the aforementioned facts, the demand of renaming it is intricately linked with the communal divide between the two communities, but political interests also get into the fray. As a result, even the genuine demands for an objective rewriting of history get politically stained and ultimately add on to communal hatred. Additionally, an objective rewriting of history needs to be done in an unbiased manner. Once the larger project of historical inquiry is conducted in earnest, there remains no need for petty communal moves like renaming places. In fact, old names can be retained as souvenirs of history seen objectively, not as good or bad. I would like to argue that it is high time we moved from such symbolic and superficial gestures and addressed the core issues of governance and politics. Even if we want to address the questions of identity, the issue will remain unaddressed without an objective and impartial reading and writing of history. Such an attempt will serve genuine academic objectives, rather than facilitating narrow political gains at the cost of communal harmony. Lastly, the desire to reclaim the glories of history is not unusual – it comes from the most primary human sentiment. However, the effort should not be driven with hatred and false pride. While doing this, I would recommend that an attempt should also be made to explore the reasons for the defeat at the hands of foreign powers. The factors, including our own civilisational distortions, corruption, moral decadence, insular attitude and the lack of scientific outlook, all led to the mighty collapse of India’s ancient glory at the hands of foreign invaders, and must be pondered upon to learn lessons from our past. Such lessons need to be applied in the current context; not with the historical baggage of hatred, but with an open, tolerant and inclusive mind. The author is a graduate of Cornell University. Currently, he serves as Strategic Advisor to Vidya Bhawan, Rajasthan. He writes on socio-political issues for Vivekananda Foundation, Fair Observer, Huffington Post. He tweets @abhinavpandya (twitter.com/abhinavpandya). 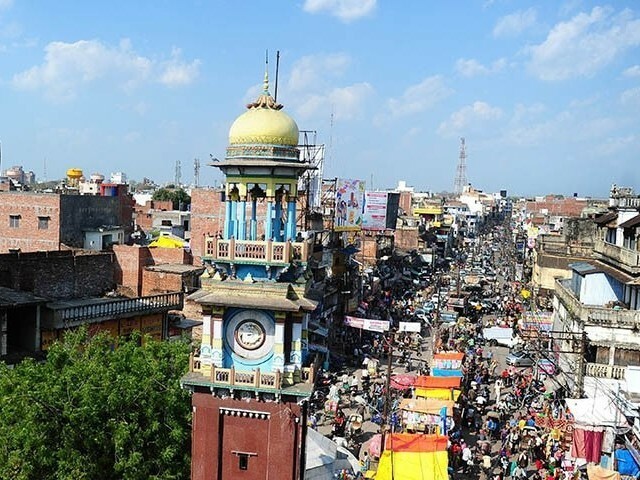 My Indian friends told me that most people of Allahabad have been calling it Prayagraj for ages just as in Pakistan, most people of Sahiwal have been calling it Sahiwal even when its name was Montgomery. Similarly I believe that Mumbai, Chennai and Kolkata names were frequently used in those cities before they officially got changed. Question : Is the county’s official name India or Hindustan or Bharat or all three ? Changing the names of the cities is wrong, it is crazy.